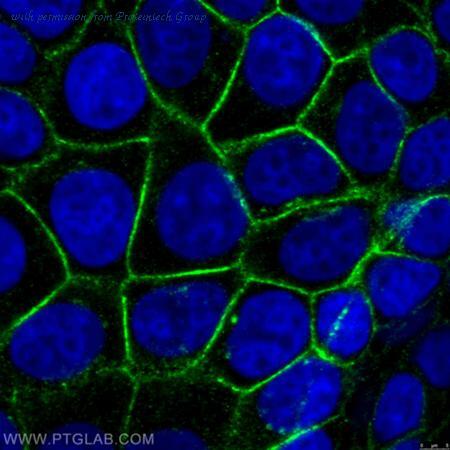 The beta-Catenin antibody from Proteintech is a rabbit polyclonal antibody to a peptide of human beta-Catenin. This antibody recognizes human, mouse,rat,pig antigen. 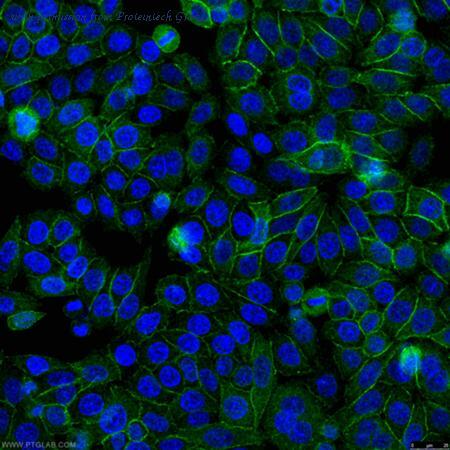 The beta-Catenin antibody has been validated for the following applications: ELISA, IF, WB, IHC, IP analysis. 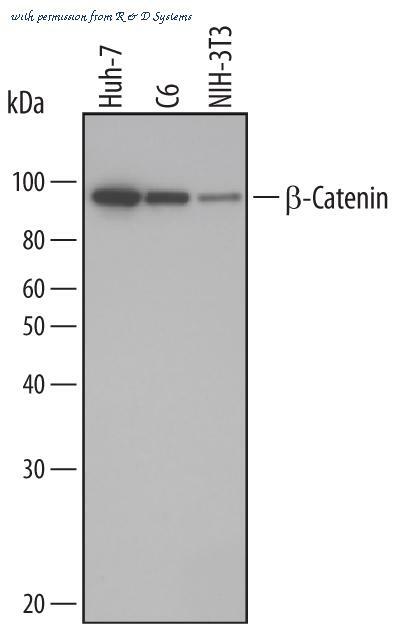 The beta-Catenin antibody from Proteintech is a rabbit polyclonal antibody to a recombinant protein of human beta-Catenin. This antibody recognizes human,mouse,rat,zebrafish antigen. 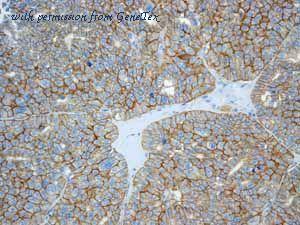 The beta-Catenin antibody has been validated for the following applications: ELISA, IF, IHC, WB analysis. 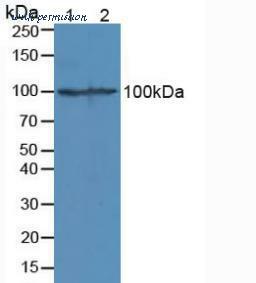 The beta-Catenin antibody from Proteintech is a mouse monoclonal antibody to a peptide of human beta-Catenin. This antibody recognizes human, mouse, rat, pig antigen. 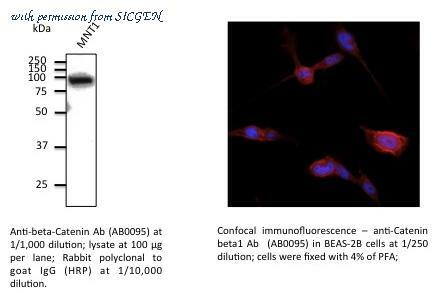 The beta-Catenin antibody has been validated for the following applications: ELISA, IHC, WB analysis. 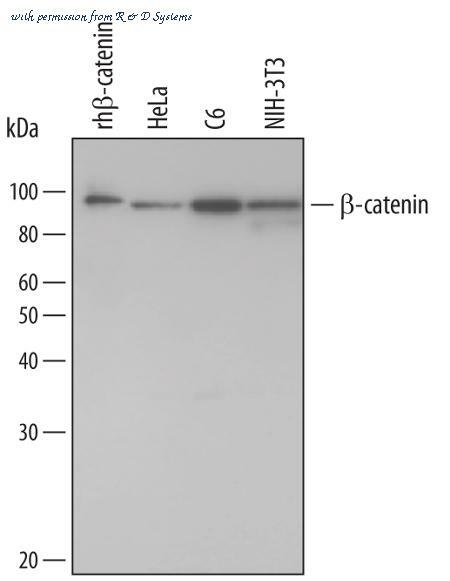 Detection of Human/Mouse/Rat beta-Catenin by Western Blot. Western blot shows lysates of HeLa human cervical epithelial carcinoma cell line, C6 rat glioma cell line, and NIH-3T3 mouse embryonic fibroblast cell line. 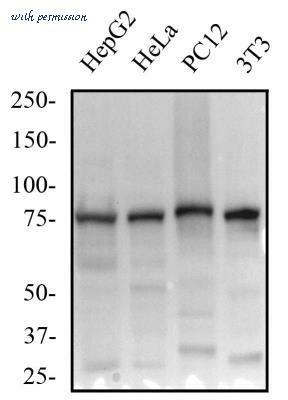 PVDF membrane was probed with 1 ╡g/mL Goat Anti-Human/Mouse/Rat beta-Catenin Antigen Affinity-purified Polyclonal Antibody (Catalog # AF1329) followed by HRP-conjugated Anti-Goat IgG Secondary Antibody (Catalog # HAF109 ). For additional reference, recombinant human beta-catenin (1 ng) was included. A specific band for beta-Catenin was detected at approximately 95 kDa (as indicated). This experiment was conducted under reducing conditions and using Immunoblot Buffer Group 1 . 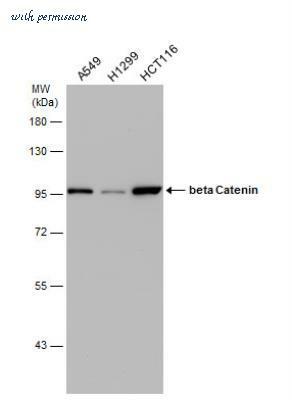 Detection of Human/Mouse/Rat beta-Catenin by Western Blot. Western blot shows lysates of Huh-7 human hepatoma cell line, C6 rat glioma cell line, and NIH-3T3 mouse embryonic fibroblast cell line. 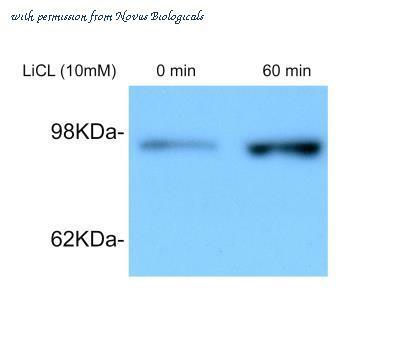 PVDF membrane was probed with 2 ╡g/mL of Mouse Anti-Human/Mouse/Rat beta-Catenin Monoclonal Antibody (Catalog # MAB1329) followed by HRP-conjugated Anti-Mouse IgG Secondary Antibody (Catalog # HAF007 ). 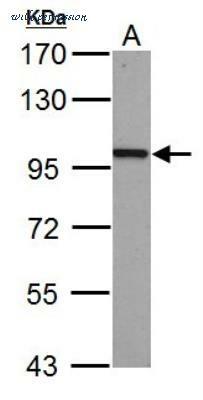 A specific band was detected for beta-Catenin at approximately 95 kDa (as indicated). This experiment was conducted under reducing conditions and using Immunoblot Buffer Group 3 . 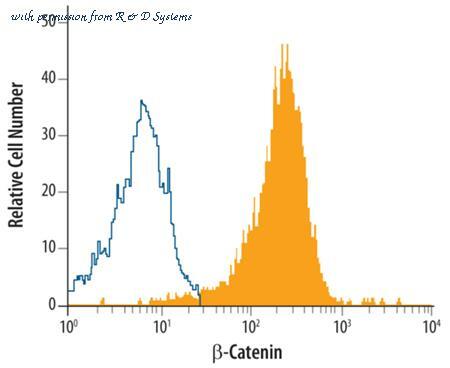 Detection of beta-Catenin in HeLa Human Cell Line by Flow Cytometry. HeLa human cervical epithelial carcinoma cell line was stained with Human/Mouse/Rat beta-Catenin Monoclonal Antibody (Catalog # MAB13292, filled histogram) or isotype control antibody (Catalog # MAB003, open histogram), followed by Allophycocyanin-conjugated Anti-Mouse IgG F(ab')2 Secondary Antibody (Catalog # F0101B ). 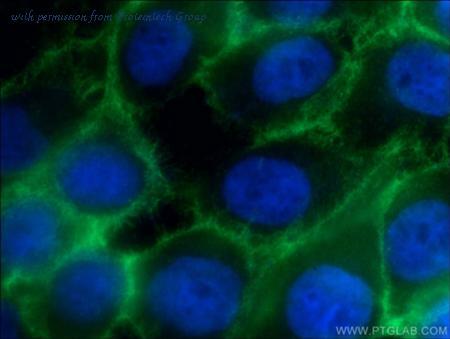 Immunocytochemistry/Immunofluorescence: beta-Catenin Antibody (12F7) [NBP1-54467] - The beta- Catenin antibody was tested in MCF-7 cells against Dylight 488 (Green). 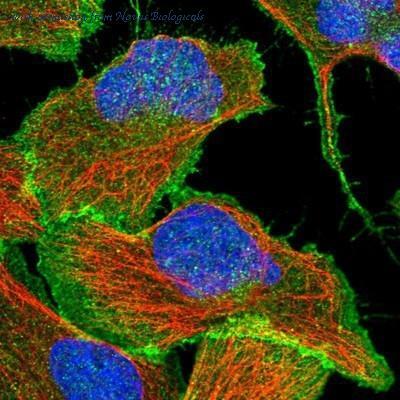 Actin and nuclei were counterstained against Phalloidin 550 (Red) and DAPI (Blue). Immunohistochemistry-Paraffin: beta-Catenin Antibody (12F7) [NBP1-54467] - IHC analysis of beta Catenin in mouse intestine using DAB with hematoxylin counterstain. Simple Western: beta-Catenin Antibody (12F7) [NBP1-54467] - Simple Western lane view shows a specific band for Beta- Catenin in 0.5 mg/ml of HepG2 lysate. This experiment was performed under reducing conditions using the 12-230 kDa separation system. 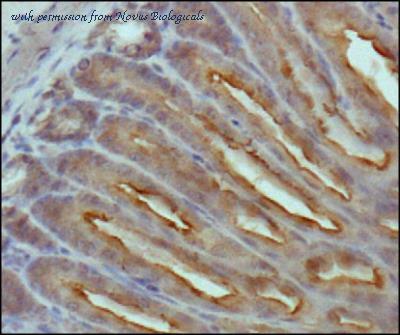 Immunohistochemistry-Paraffin: beta-Catenin Antibody [NBP1-89989] - Staining of human stomach shows strong membranous and cytoplasmic positivity in glandular cells. Immunocytochemistry/Immunofluorescence: beta-Catenin Antibody [NBP1-89989] - Staining of human cell line U-2 OS shows positivity in plasma membrane. 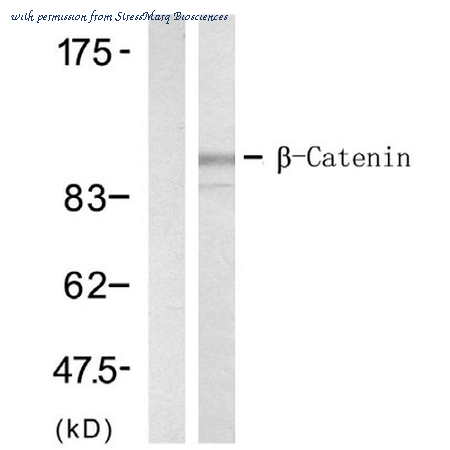 Western Blot: beta-Catenin Antibody [NBP1-89989] - Analysis in mouse cell line NIH-3T3 and rat cell line NBT-II. 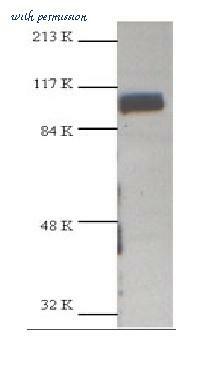 Flow Cytometry: beta-Catenin Antibody [NBP1-32239] - HeLa cell.Black: Unlabelled sample was used as a control. Red: beta Catenin antibody [N1N2-2], N-term dilution: 1:50.Acquisition of 20,000 events were collected using a Dylight 488-conjugated secondary antibody for FACS analysis. 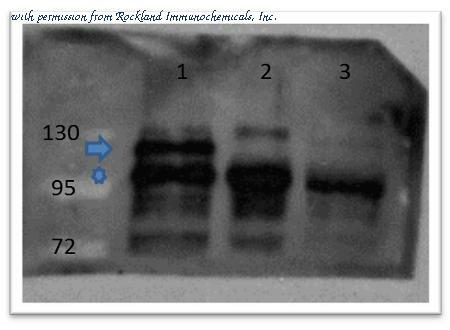 Western Blot: beta-Catenin Antibody [NBP1-32239] - Western blot for beta-catenin in HEK 293 cells treated with LiCl (10mM) for 1 hr. Image from verified customer review. ICC/IF analysis of A431 cells using beta Catenin antibody [E247] at a dilution of 1:250. IHC-P analysis of IHC analysis of human colon adenocarcinoma tissue using beta Catenin antibody [E247] at a dilution of 1:500. 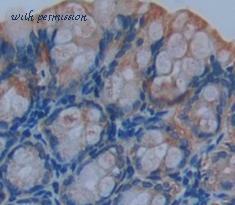 IHC analysis of kidney carcinoma tissue using beta Catenin antibody [E247]. 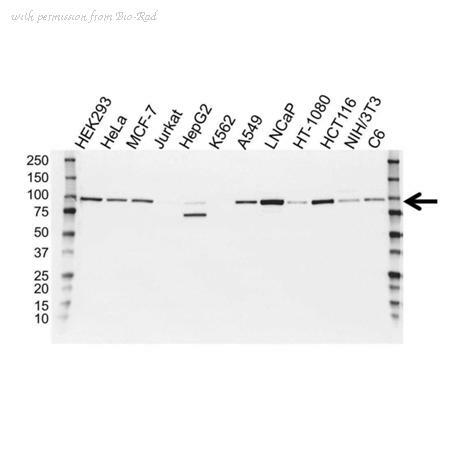 Western blot analysis of Human SW626 cell lysates showing detection of ~94kDa beta Catenin protein using Rabbit Anti-beta Catenin Polyclonal Antibody (SPC-1318). 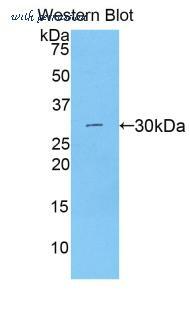 Primary Antibody: Rabbit Anti-beta Catenin Polyclonal Antibody (SPC-1318) at 1:1000. Predicted/Observed Size: ~94kDa. application: WB. dilution: 1 : 1000, sample: HELA cell lysate. Western Blot of Rabbit anti-catenin ß-1 antibody Lane 1: zebrafish embryos injected with myc tagged catenin ß 1 mRNA Lane 2: zebrafish embryos injected with myc tagged catenin ß 2 mRNA Lane 3: zebrafish embryos un-injected Primary antibody: catenin ß-1 antibody at 1:500 overnight at 4°C Secondary antibody: goat anti-rabbit HRP at 1:10,000 for 1 hour at RT Predicted/Observed size: 85.5kDa/ ~125kDa (arrow) endogenous catenin ß-1 Other band(s): ~110kDa (star) co-migrating catenin ß-1 and ß-2. Western Blot; Sample: Lane1: Mouse Liver Tissue; Lane2: Mouse Brain Tissue. Western blot of recombinant CTNNB1 / Beta Catenin. This image was taken for the unconjugated form of this product. Other forms have not been tested.